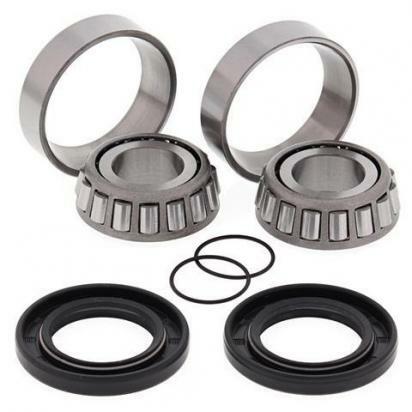 The picture below shows a Swinging Arm Pivot Bearing Kit (By All Balls USA). Thousands of other top quality spares listed on our website at refreshingly low prices. Kit contains all of the bearings, seals and bushings required to rebuild a swing arm to factory specifications. All Balls bushings are manufactured from 52100 bearing steel for improved performance and extended life. All Balls Kits feature TeflonD coated washers in place of the thrust needle bearings. The TeflonD coated washer offers superior resistance to dirt, water and lack of lubrication which are all factors leading to permature failure.